Fujifilm has introduced the FinePix XP130, the first rugged XP to feature Bluetooth. Other features include a 5x 28-140mm equivalent optical zoom, Electronic Level, Eye Detection and five body colors. The XP130 also features WiFi, Full HP video at 60 fps, geotagging support, 10 fps continuous shooting, double exposure and interval shooting. It's waterproof to 65.6 feet, shockproof, freezeproof and dustproof as well. Fujifilm said the FinePix XP130 in lime, silver, blue, white or yellow will be released in March for $229.95. Adorama and B&H are both now accepting pre-orders. VALHALLA, N.Y. -- Fujifilm North America Corp. has announced the FinePix XP130, the newest addition to the rugged XP series. The XP130 is the first in the line to feature the latest Bluetooth technology for easy to use, instant image transfer and is also equipped with new shooting functions such as an Electronic Level and Eye Detection to provide even greater versatility. Equipped with a Fujinon lens and four rugged protection features in a lightweight body, the new XP130 is durable and delivers high quality images, making it the perfect companion for any kind of adventure. The XP130 is waterproof up to 65 feet/20 meters, shockproof up to 5.7 feet/1.75 meters, freeze proof to 14[!]deg;F/-10[! ]deg;C and dustproof and features a protective, double-locking mechanism for the battery compartment. With a grip design for firm one-handed grip, the new XP130 is designed for ease of use and is tough enough for shooting in all situations. Now featuring the latest Bluetooth technology, the XP130 can instantly transfer images to a smartphone or tablet, while syncing time and location information from the camera to the images. Utilizing the free "Fujifilm Camera Remote" app, users can take advantage of this new feature to quickly and easily share photos and videos with family or friends. Images can even be transferred from the XP130 directly to an Instax SHARE Printer. The new XP130 is equipped with a 16.4-megapixel back-illuminated CMOS sensor and Fujinon 5x optical zoom lens that includes a 28mm wide-angle setting and provides unique color reproduction technology and advanced sharpness to deliver outstanding image quality. With Intelligent Digital Zoom technology, the optical zoom range can be doubled to 10x and, utilizing optical image stabilization, the XP130 minimizes the effects of camera shake even in low light conditions. Bluetooth Pairing and Wireless LAN connectivity, Smartphone Transfer and the Fujifilm Camera Remote app. Transfer photos and videos from the XP130 to your smartphone or tablet or directly to the Instax SHARE SP-2 or SP-3 Printer for quick, high-quality prints. Scene Recognition Mode quickly determines the scene before optimizing focus, exposure and shutter speed for best possible results. Underwater and underwater macro functions available. Electronic Level Feature: Can be used to capture horizontal subjects. Eye Detection feature helps to capture portraits easily by automatically focusing on subject's eyes. Interval Timer Shooting: Automatically shoots any number of images in set intervals. Interval can be set to either 5 or 10 minutes or 15, 30 or 60 seconds. TimeLapse Video: Automatically converts images taken with interval timer to video. Frame rates of 10fps, 30fps or 60 fps can be selected along with three different types of movie size, including full HD. Allows for capturing transitions in nature from a stationary point, such as sunsets or opening flowers. Motion Panorama 360[! ]deg; function for superb panoramic shots and the Advanced Filter function to create advanced artistic effects with ease. Select from 11 filters when taking pictures or 7 filters during video recording. 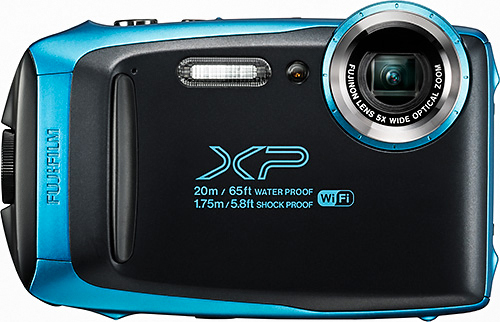 The FinePix XP130 will be released in March in the U.S. and Canada for USD$229.95 and CAD $239.99.